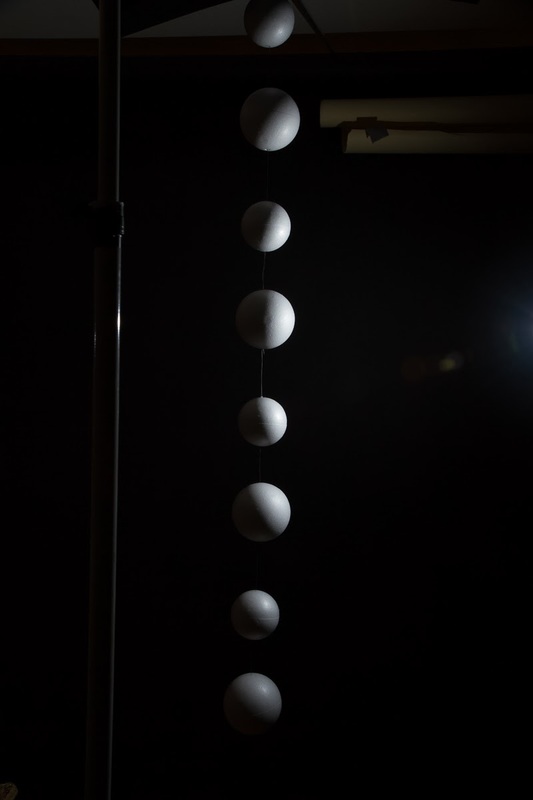 or the use of styrofoam balls to evaluate light sources. After thinking about ways to evaluate softboxes, brollies and the like, I decided to try polystyrene balls as a target to better see what is going on and it works really well. Here is a set of balls I got from hobbycraft - middle sized and big ones alternating - hanging in front a bare naked flash (Yongnuo 565), set to 24mm with the diffuser in place. The balls are all lit with a hard edge around the circumference of each ball, there is a little reflected light showing from the white ceiling and other balls, but not enought to matter really. Below is a zoom in on the centre 3 balls.